Bon, on ne va pas prendre de gants ou de fleurs pour parler de ce système qui est tout SIMPLEMENT INDISPENSABLE POUR TOUTE PERSONNE AYANT UNE PLATINE VINYLE !!!!!!!! Ce système étant le seul ayant le calcul de placement UNI-DIN qui est ABSOLUMENT EXTRAORDINAIRE!!!! Ce placement permet de doubler le prix de votre platine. Ce jeudi 20 Aout, nous sommes après deux semaines, sur 12 installations chez nos clients. Et à chaque fois, c'est ... !!!! 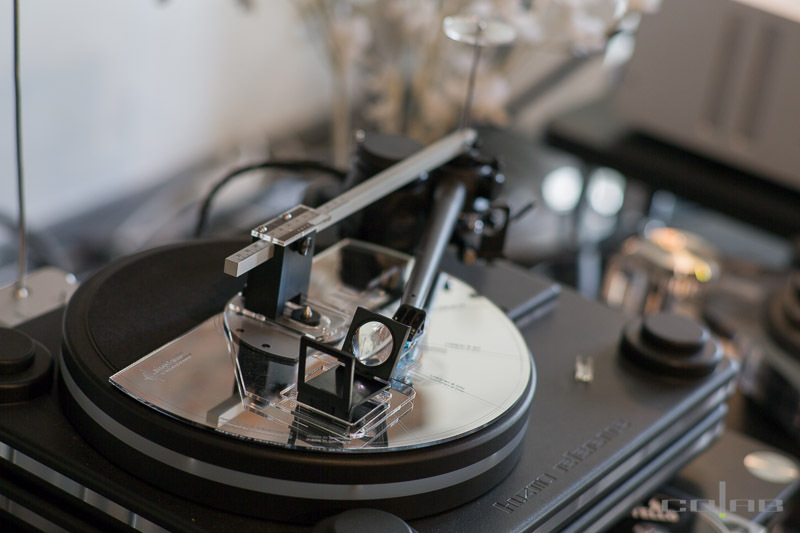 While the UNI-Protractor represents the most universal and versatile phono alignment tool ever introduced in high-end audio, it is an instrument which - due to it’s complexity and versatility - appeals more to professional users. The serious audiophile who is interested in aligning - if only periodically - his analog front-end to the utmost precision does look for precision which comes handy and which is easy to operate. 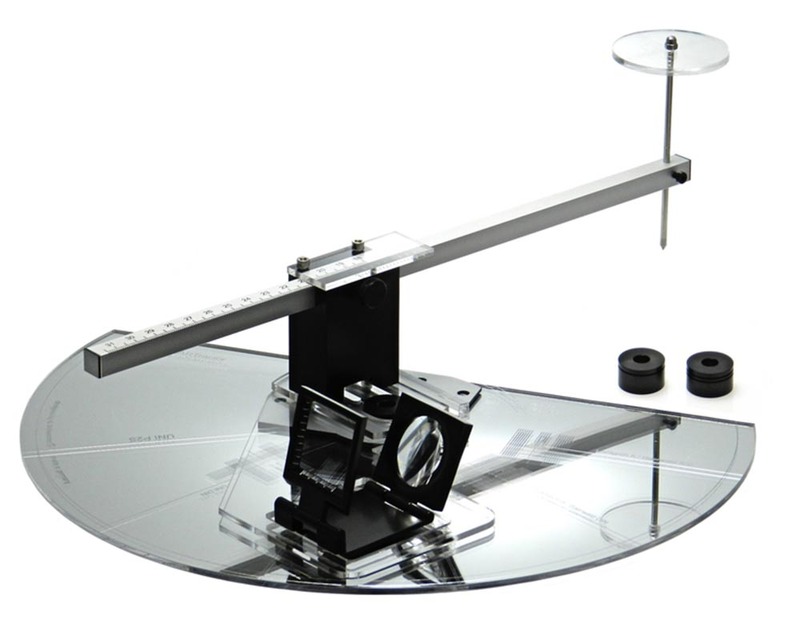 To answer this request we have designed the SMARTractor - a direct off-spring of our UNI-Protractor. The SMARTractor brings the same unparalleled precise tangential alignment for which the UNI-Protractor earned it’s laurels - PLUS the 0.05mm precise mounting distance measurement of the UNI-P2S. The SMARTractor comes with 5 (five) tangential curves combined in 1 (one) template. the SMARTractor's template is made from 3mm (= same thickness as 180 gr LP) strong premium grade german XT mirrored acrylic supplied by Evonik. no-error-possible single-point alignment with 3mm deep parallax (for ALL helping lines) - an extreme precise, easy and fast alignment. super easy to use with 1-point fixed setting for every tangential curve. all alignment lines are cnc-laser cut hairlines. incorporates real glass aluminum-frame magnifier with automatic focus jig for unrivaled precise magnified view during alignment. all 5 tangential alignments are based on true triangular positioning and thus are independent of effective length and thus suitable for ALL pivot tonearms, no matter what their effective length or mounting position. The SMARTractor further comes with in-built direct mounting distance - P2S -measurement with 0.05mm accuracy. The total of 5 tangential options of course includes the old audio phono standards set by Loefgren and Baerwald in the late 1930s and 1940s in both - IEC and DIN - norms. furthermore the SMARTractor features the critically acclaimed UNI-DINtangential curve. An all new tangential curve which is the latest calculation and the first one which does really take into account the special requirements and circumstances of a stereo stylus tracking a non linear stereo groove with increasing differences between the two groove walls. The result? - real sonic benefits! In the last 2/3 of the record's groove, the UNI-DIN curve offers significant (18-45%) less average - as well as less total! - distortion than Baerwald or Loefgren. Sonically this gives you less stress on human (female) voices, more subtle details, less "grain", increased "air" and considerable more "headroom" in critical passages and especially so in climaxes. Rest assured - you'll love it, once you've heard it's direct results and merits. the UNI-DIN tangential alignment is available only in the SMARTractor and the UNI-Protractor. Now - why 5 different options for alignment of cartridge/tonearm? The vast number of tonearms introduced in the past 40 years not only displays a large number of different concepts, but also a considerable diversity in geometries. Furthermore it makes a significant difference whether the record we want to track with best possible results is a modern pressing with a very long run-out/lead-out ('unmodulated groove' or 'dead wax'), or whether the record's groove is cut close to the paper inner label. The later is often found with countless records made in the early stereo years from 1958 up till 1974. The SMARTractor takes into account the diversity of geometries found in pivot tonearms - as well as the different situations in records past and present. The SMARTractor offers the best possible tangential curve for every request. For every pivot tonearm - as well as for every record collection. And it makes sure that the serious audiophile gets the most perfect, utmost precise alignment possible. Even more important, this ultra precise result is achieved swift, with ease and free of any possible error. No in-deep knowledge nor any special manual skills are required. Setting up your analog front-end with unparalleled precision - and with the BEST SONIC results obtainable - is only a matter of a few minutes when using the SMARTractor.